Handmade by Navajo artist Terry Martinez. Terry Martinez is a world class Navajo silversmith and has been creating jewelry for over 30 years, he uses traditional practices and techniques to create his works of art. 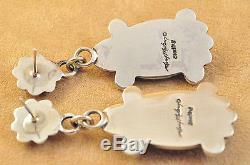 Most of the silver on his pieces is pounded out with a hammer into the desired shape. 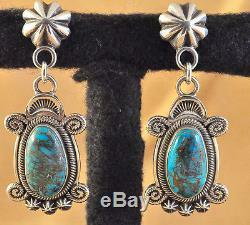 This is a pair of sterling silver handmade Navajo dangle earrings with natural Morenci Turquoise. The stones are a rich blue color with a reddish brown matrix. The stones sit in a smooth bezel. Terry added a hand-braided rope of silver to the base of the stones. Martinez also added one braided silver rope to the sides of the top and bottom, one stamped crescent shape to the tops, and three star stamped beads to the bottoms, making the over all design look like turtles. The posts are big hand stamped star beads. Beautiful and flawless silver work! These earrings measure 2-3/8 inch by 7/8 inch. The stones measure ¾ by 1/2 inch. The star posts measure just over ½ inch. Stamped Sterling and Terry Martinez. The item "Terry Martinez Handmade S S Navajo Dangle Earrings Natural Morenci Turquoise" is in sale since Tuesday, October 20, 2015. This item is in the category "Jewelry & Watches\Ethnic, Regional & Tribal\Native American\Earrings". The seller is "jullsbuys" and is located in Albuquerque, New Mexico. This item can be shipped worldwide.